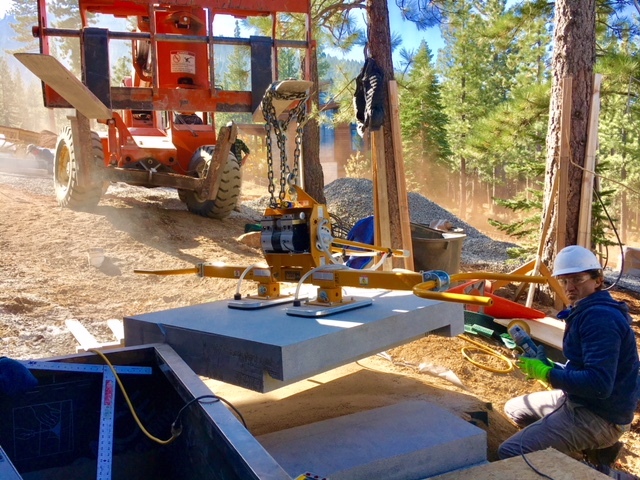 THE GOALS OF SCALE AND SIZE WERE ACHIEVED BY USING MONOLITHIC PIECES OF GRANITE RISERS AND LANDINGS AND BASALT WALL STONE THAT RANGED FROM 800 TO 3,000 POUNDS. FURTHERMORE I HAD 3 TEXTURES (ADZE, FLAMED AND LYCHEE) APPLIED ROTATIONALLY TO EVERY EXPOSED SURFACE TO "AWAKEN THE STONE'S POTENTIAL". FOR SOME STUNNING EFFECTS WE "KEYED" WALL CORNERS AND "EXTRUDED" RISERS FROM WALL FACES. FOR A FINAL DETAIL WE HID A NUMBER OF THE LIGHT FIXTURES INSIDE HOLES WE DRILLED INTO THE WALL.